You are currently on: How can we offer affordable, accessible and effective quit smoking support for millions of people in low to medium income countries? How can we offer affordable, accessible and effective quit smoking support for millions of people in low to medium income countries? 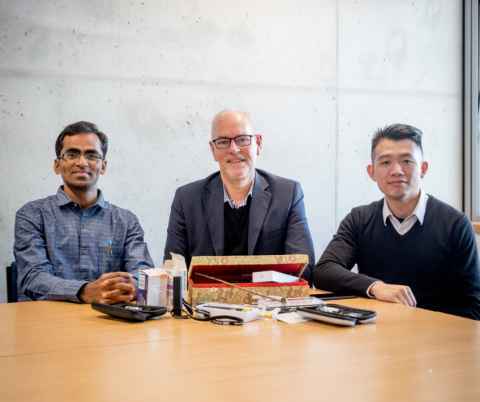 Professor Chris Bullen (centre), with Doctoral Candidates Dr Anantha Kumar and Jinsong Chen, Population Health, Faculty of Medical and Health Sciences. Hundreds of millions of people in low to medium income countries smoke tobacco, leading to premature death and disability, inequality and poverty. When a smoker in a household quits the whole family receives health and wealth benefits. Population-level policies (warning labels, tax increases and so on) are necessary, but so is personal support for smokers, to help increase their chances of quitting successfully and permanently. Dr Anantha Kumar is testing a new, primary care-based model to support smokers to quit in rural India. Jinsong Chen is testing a unique mobile phone-based support programme for millions of Chinese men who smoke. The potential for the resultant models to support many people in improving their health is huge. Our work requires strong partnerships with people and their families, communities, health workers, as well as other universities, non-governmental organisations and other agencies in India, China and New Zealand. We’d like to scale up our ideas and models of intervention into other areas, such as better diets and self-care of diabetes, assuming our testing in clinical trials supports this direction.